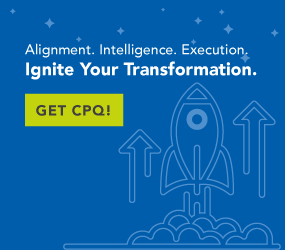 CPQ or Configure Price Quote software, offers a useful and effective vehicle for achieving digital transformation within the sales transaction process and exploits virtually every aspect of BI, IoT, Cloud and AI. CPQ uses these technologies to obtain and process the data required to specify, design, price and configure effective solutions to perfectly match the complex requirements, pains and needs specified by the customer. CPQ also transmits this data into the manufacturing process thus supplying critical information required for the planning and scheduling of manufacturing resources. Digitalised product data triggers supply chain, inventory and Kanban systems to drive the manufacturing process. This data ensures that digital manufacturing execution systems, additive manufacturing (3D) and robotics systems are properly marshalled and supplied to build the product to specification and in accordance with the customer’s needs. When computers first began to gain a toehold in the world of business processes, some optimistic wag predicted the death of paper. The concept of the “paperless office” was developed, and it almost instantly grabbed the imagination of everyone who worked in an office. Almost everyone loved the idea of getting rid of the millions of cubic feet of paper records used to record and conduct business transactions. The problem was, no one wanted to give up “their” paper. For years, the paperless office remained an elusive goal while computer peripheral manufacturers produced faster and faster printers, and paper companies continued to turn in higher and higher profits. While the paperless office is still something of a fantasy, the whole notion of digital transformation finds its origin in that struggle to achieve a paperless work environment. While paper (even today) offers some advantages for the storage of active transactional information, it offers little value as a long-term storage medium and less as a high-volume storage medium. Digitised data represents the highest evolution of information as an enterprise resource. We live in a data-driven world. Data is the grist used by our systems to do the jobs they are designed to do. CPQ is no exception to that rule. The inputs required by CPQ to “do its thing” are derived from digitized product information in the form of part numbers, assembly and subassembly numbers, size and weight metrics, fabrication materials, color options and other descriptors. CPQ breaks down each complete, fully configured potential product into its individual component pieces. CPQ then looks at each product from the standpoint of usage limits. It looks at how each part relates with other parts. If a part is available in stainless steel, ceramic or polymer, CPQ will evaluate why one option is selected over another. Those fabrication options, along with the specific reasons for selecting one versus the other, are encoded into business rules that either make the specific option available or restricted during the configuration process. All of the part data and associated business rules work together to configure and price the finished product to match the needs of the customer. Customers and prospects come to the table with varying levels of knowledge about their needs and product requirements. Probably the first question asked by the first sales rep in history was something along the lines of, “Tell me more about what you want.” It doesn’t matter if you are selling shoes or rocket ships, the sales rep needs to know what your needs are before anything else can happen. The modern customer experience may well have modified what this information exchange looks like, but it still happens. The sales rep and customer may engage in a one-on-one conversation; the customer may fill out a needs description form; or the customer may engage with a digital interface, answering questions and making choices based on the answers the customer has supplied. The customer experience goal should be to get the customer’s needs identified and specified as quickly and accurately as possible. CPQ achieves this through an interactive questionnaire. Either directly through an e-commerce solution or proctored by a sales rep, the interactive interview guides the sale and the conversation from hello to goodbye. The business rules engine invokes specific limitations as the questions are answered. All of those customer-needs inputs are effectively transformed from the vagaries of human language conversation to the explicit and unambiguous digitised data points used by CPQ. Once the product is configured and the order is placed, CPQ releases data toward several back-office destinations. The order management system, the supply chain management systems and the production scheduling systems all receive the information they need to move ahead with filling the order, shipping it and billing the customer. Resources required in terms of inventory and scheduling the delivery of parts to the proper positions on the shop floor, as well as the programming of needed robotic, additive and other manufacturing technologies, are completed. The product is built to specification and shipped to the customer as required. CPQ sits precisely in the middle of the digital transaction. The customer’s needs, the product information and the requirements for filling the customer’s order are all digitised and digitally processed to ensure that the product is properly configured, priced and delivered.